This is a tasty pizza for those who can tolerate dairy. I’ve only made this recipe once and it took forever to grate the cauliflower by hand… Best only try this recipe if you have a food processor! If you have a mild lactose intolerance (like me) then you can usually get away with the occasional small amount of dairy-product. Hard cheeses such as Cheddar and Parmesan contain a lower content of lactose than softer cheese which, suit me just fine since I prefer the more mature cheese. Cauliflower Crust: Coat a cookie sheet with a thin layer of olive oil. Spread grated cauliflower across oil-glazed cookie sheet and bake in oven at 200°C for 15-20 minutes. In a bowl, mix cauliflower, cheese, egg, garlic and oregano until well combined and dough-like in texture. Toppings: Bake sweet potato in oven at 200°C for 1 hour, or until well done. Heat 1 tbs. of olive oil in frying pan and saute kale until wilted, about 5 minutes. Set aside. Remove sweet potato from skin and mix in a bowl with salt. 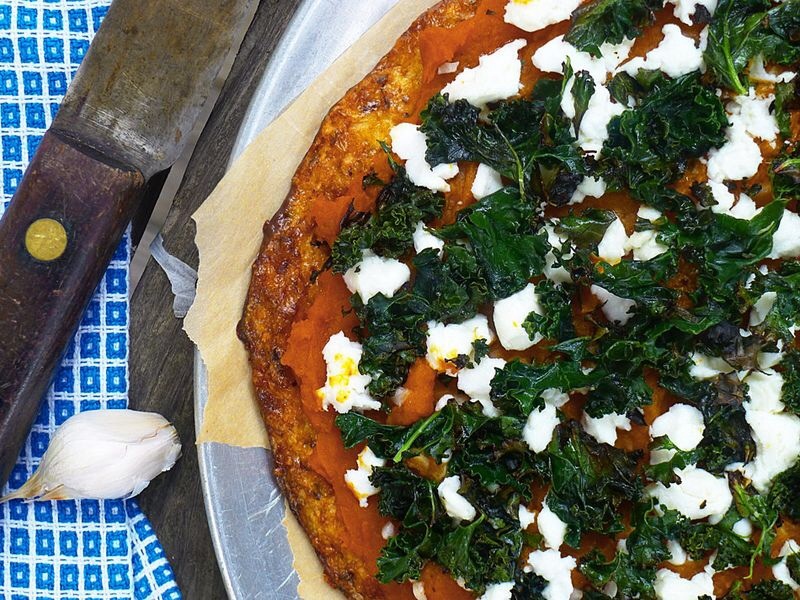 Pizza: Spread sweet potato mash onto pizza crust and top with garlic. Sprinkle goat cheese and kale on top of potato layer. Bake in oven at 175°C for about 10-15 minutes. Let cool for 5 minutes. Slice, serve and enjoy.